Want to succeed at trading the markets? Good trading tactics start with finding reliable support and resistance. These critical zones are helpful for entering new trades and for taking profits. Finding reliable support and resistance is a crucial ability of a professional trader. Support and resistance are supply and demand manifested by price action. Learn to ignore the market noise on your charts. Focus on finding the support and resistance zones that matter for your trading plan. There are many ways to find support and resistance. But for the best results, you should concentrate on price action and volume. Hence, the five methods here are mainly derived from price action and volume. When you track market swings, you are following the turning points of price action. Each turning point is the result of the market being supported or resisted. Hence, observing market swings is fundamental to identifying support and resistance levels. The example below shows how swing pivots acted as support before flipping into a resistance level. Many novice traders had only a vague introduction to drawing swing highs and lows. As a result, they lack precise rules for marking out swing highs and lows. This subjectivity is a huge problem. On historical charts, you can mark out swings that perform well as support and resistance. But you will find it tough to replicate the same results on a real-time chart. 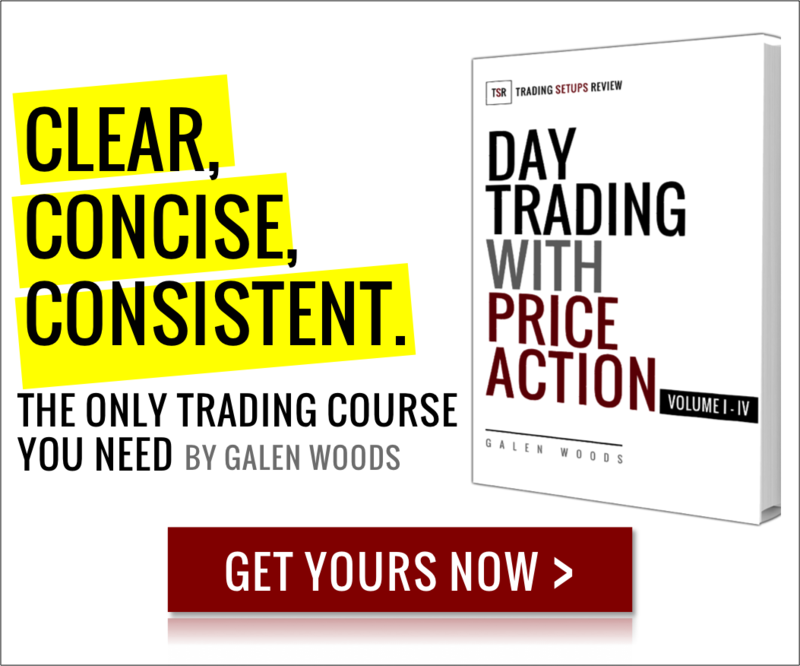 To ensure consistency, you must learn an objective method for marking market swings. One standard method for marking out swings is the percentage method. In my course, I cover another swing analysis method based on bar highs and lows. Congestion areas are one of my favorite ways to find support and resistance zones. When the market congests within a price range, it means that the market is interested in that price range. And market interest is not quickly forgotten. Thus, past congestion areas become significant support and resistance. The blue zones below are Congestion Zones as defined in Day Trading With Price Action. Note the three Congestion Zones within a tight price range. This observation implied its potential as a support (resistance) area. 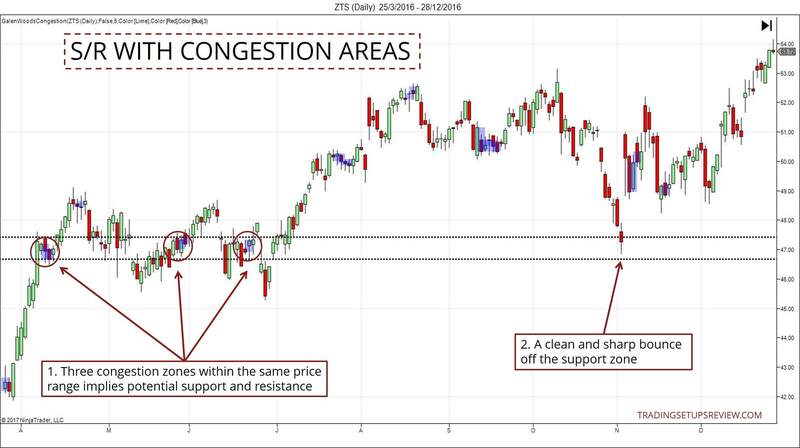 Learn more about trading with congestion areas with this article. Remember, support and resistance is merely market interest manifested as price action. You are looking for the interest of the market. Hence, you must not overlook trading volume. If you are interested in the market, you trade it, contributing to its trading volume. The same goes for everyone else. Hence, trading volume is a powerful indicator of market interest. In practice, you should look for price bars (candlesticks) with extremely high volume. Then, use them to project support and resistance. What is extremely high volume? Tip: Use the Upper Band of a Bollinger Band applied on volume to identify these extreme signals. If you look closely at the price action before the high volume bar, you will notice sideways trading. Both congestion areas and high volume bars are signs of market interest. Hence, it’s common for them to occur together. 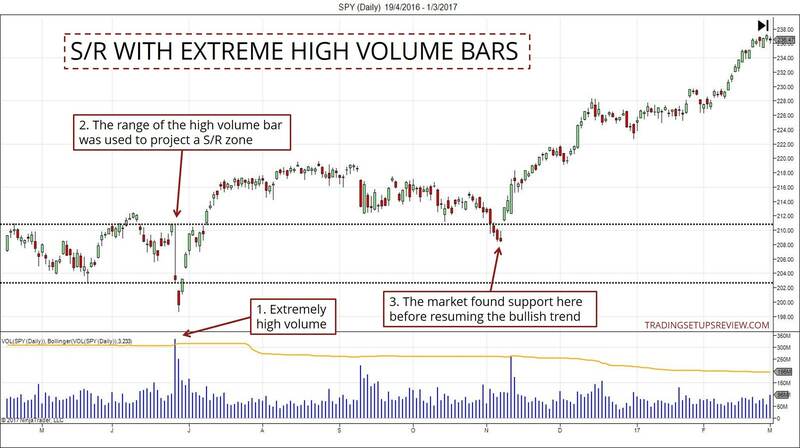 For more examples, see this article – Reliable Support and Resistance Zones With High Volume Signals. Price gaps are also effective support and resistance zones. Why? Gaps create a vacuum. Although the market has moved past them, no actual trading has taken place within the gap zone. Hence, traders who intended to buy or sell within the gap range missed their chance to do so. And they are now waiting for the market to give them a second chance. When the market returns to the gap, they will seize that second chance and send in their trading orders. This behavior creates the potential for support or resistance zone. In the example below, you will see how a bearish gap acted as an effective market resistance. 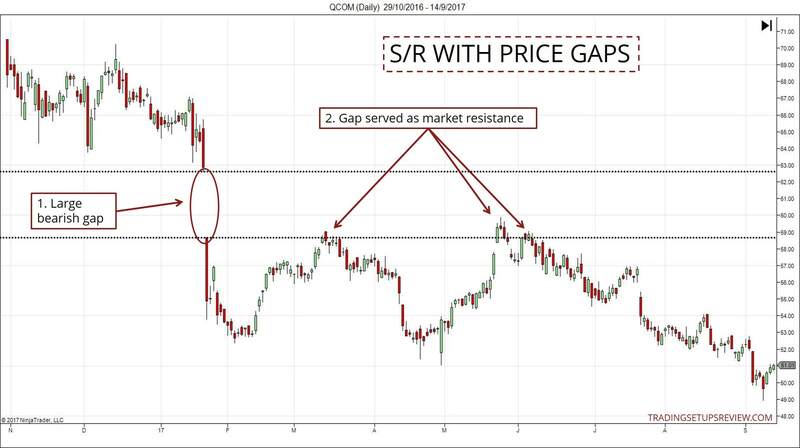 Using price gaps as a support and resistance zone is a rewarding strategy for the patient trader. Many traders get excited after an opening gap and are eager to get into the market. You might be better off waiting for a chance to trade the support (or resistance) that the gap implies. Nasdaq Breaks Through 6,000 Barrier, But Should We Party Like It’s 1999? They are just a small sample of headlines that show interest in specific round numbers. 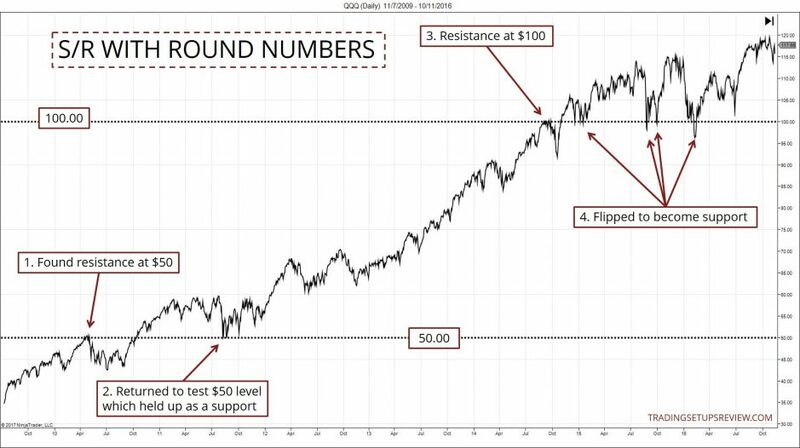 In the line chart below, you will see how the $50 and $100 levels acted as support and resistance for QQQ (NASDAQ 100 ETF). It’s clear that certain price levels have a psychological impact on investors and traders. These levels attract the market’s attention. Again, it’s all about market interest. And round numbers are the prime example. The Natural Number Trading Method is a trading strategy that tries to capitalize on this psychology. For finding support and resistance, the most important concept is market interest. You want to find out the price zones that the market is interested in. You can indeed combine the tools above for a more compelling location of market supply and demand. However, it’s good to stick with one primary technique to find support and resistance. Use other tactics to supplement it. This way, you will not dilute your attention by trying to watch out for too many features. Another point to note is this. Finding support and resistance is not enough for a trading strategy. 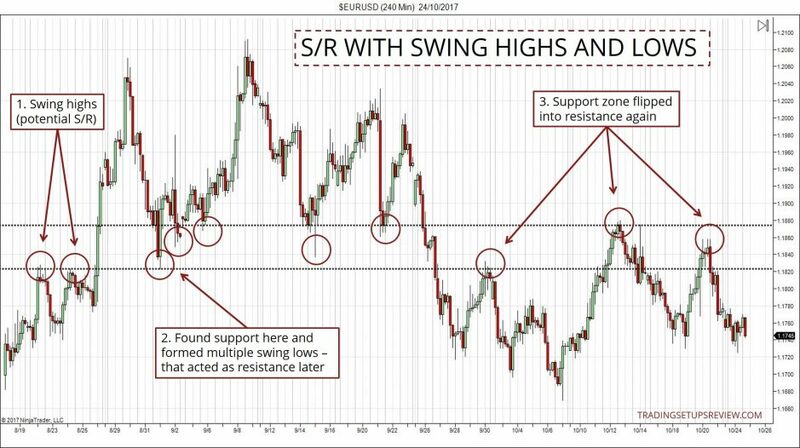 To create a trading framework, observe how price behaves around support and resistance. Consider the volatility and price action around the support and resistance. Then, form a plan to determine an entry trigger, stop-loss point, and profit-taking point. Finally, identifying support and resistance is an art. There is no guarantee that the support and resistance you find will hold up each time. In fact, it’s guaranteed that they will fail you sooner or later. Nonetheless, support and resistance is a crucial concept that you cannot ignore. Knowing how to identify support and resistance will definitely upgrade your trading performance. Thank you too. Glad you like it! I ALWAYS GOOGLE EVERY STARTEGY AND ANALYSIS OF FX MARKET.AND KEEP MYSELF UPDATE IF I STOOPED IT ONEDAY I FEEL I M NT JUSTICE TO MYSELF .LAST SOME DAYS I LOOKING TO TSR ITS DIFFRENT AND PROCESS OF ANALYSIS IS VERY CLEAR AND SIMPLE ITS A VALUABLE GUIDE .U R THE BEST.AND THANK U AGAIN FOR UR KIND EFFORT TO HELP AND MAKE EVERYONE A BETTER TRADER.MAY GOD BLESS U .U R SUPERB SIR. I BET NO ONE CAN MATCH U.MY HEARTFUL WISHES TO U IN YOUR LIFE,AND LIKE ALWAYS IM WAITING FOR UR VALUABLE UPDATES HERE. Thank you for your kind words. I’m glad to hear that you find the website helpful. If you want to get updates on our latest articles, please join our mailing list here.